People with good health really do not know do they? They really do not get just how vital to their lives good health is. I cannot resist your giveaway! Thank you for the opportunity – assuming its open internationally? Greetings Birdie– It is indeed open internationally. I’ll be emailing you later so you can remind me of your current mailing address. Good health… so true. There’s been a lot of nastiness in the San Francisco newspaper lately about disabled parking permits, a topic close to my heart. I wish sometimes there was a way to make those people understand even for a day… They really just have no idea how fortunate they are. I am sorry about the frustration! 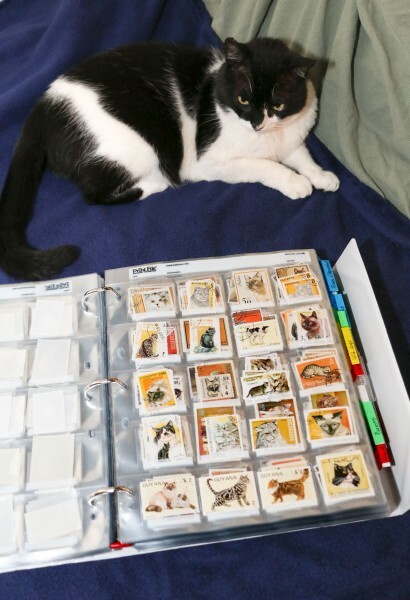 Sorting stamps does look therapeutic. Sometimes I have to find my accomplishments where I can get them, too :) I hope you both have some better days, soon. You rock! Likewise, well wishes to you and BeeGee. More medical mayhem? Unfair. So very, very unfair. However I am awed that Steve and Dom will allow you quiet time with small pieces of paper. It’s the increasing caretaking load at the moment that’s making things especially trying… Not for the squeamish, as you know only too well. “Quiet time with small pieces of paper…” I wish! Only if the cats don’t want to play. What an amazing collection, er, sorry, resource. Whatever you decide to do with it eventually I can understand the pleasure they can offer right now. I’ve only started collecting stamps again this past year or two, after giving up my childhood hobby. They really are little works of art, and the effort that some countries give to them is wonderful. I looked over at the link a bit, and will look some more. Tiny chunks is, indeed, often the only way to do anything… or some things. I find, though, that for something like assembling an edition, I really do need a block of time when I feel lucid, and when I also know I won’t be summoned at any moment away from what I’m doing, while glue is everywhere… As I say, I know you know how it goes. That said, the playthings (sketchbooks) are exactly about squeezing some creative time into what feels like no time, and they are a real sanity saver for that. That and the stamps! Wow!!!! 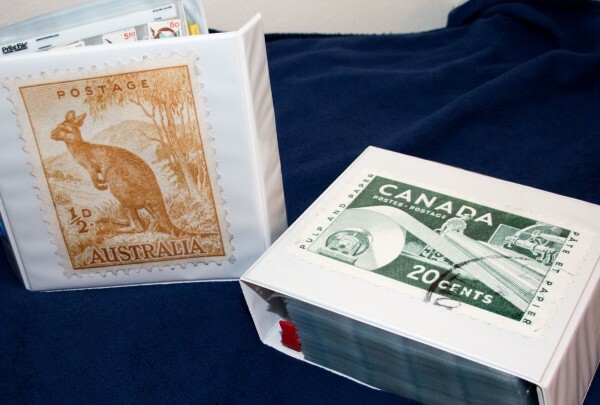 I am impressed with that stamp collection and the way you organized it. VERY cool. I am a mail artist and have a special fondness for stamps.have you seen the Stamp Head ATC’s many of us have been making? 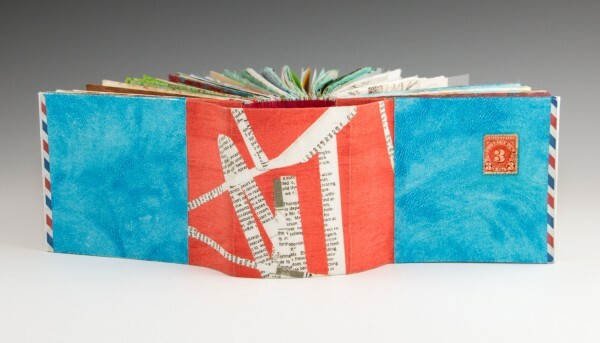 And I am learning book-making and working on making a punching cradle using your wonderful tutorial. So happy I found another stamp-lover, book-maker, artist. And I’d love to get a mailing from you. Send Good mail–Get Good Mail is my motto on my blog! Greetings! Thanks so much! What a day-brightener to get such a nice comment. I do indeed know about the stamps heads… heh heh… I don’t make them myself, but I’ve been sharing some of my extra “heads” with my friend Connie Rose who does. It’s been a lot of fun seeing what is made with them. I’ll be sure to slip a few heads into yours… I’ll be getting in touch after next Wednesday for your mailing address. howdy there! serendipitously stumbled upon your blog thanks to dear pamela, postal doyenne, at capuccinoartjounral! what a treat!! 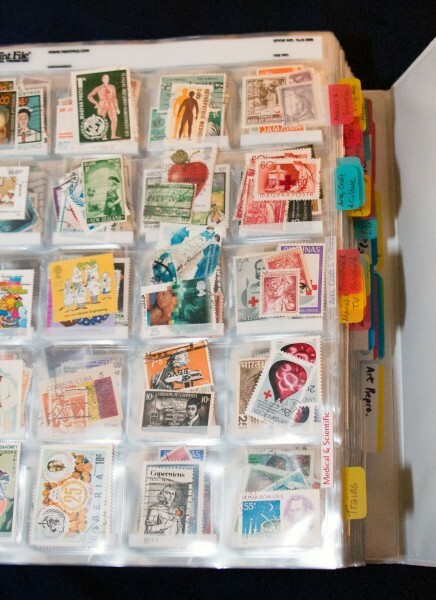 swooning full tilt over your stamp collection! thanks for sharing. Greetings Miss Polly! Thanks so much for stopping by. And thanks for your kind sympathies for Larry cat. Much appreciated. 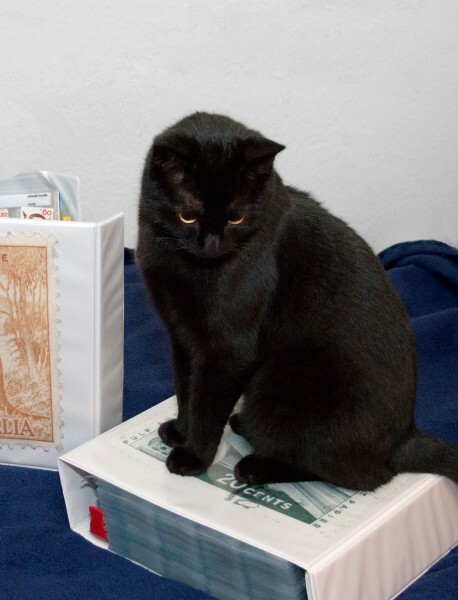 I’ll be in touch next week for postal info…. Greetings from San Diego with it’s warm, muggy days. When I get home I will have to be introduced to your latest plaything. It looks just as wonderful as your others. I have my journal with me and plan to spend some time in a coffee shop drawing—after a long walk on the beach. Love you stamp collection. Wow. Happy blogiversary too—it’s always fun to see your posts while I’m traveling (or not, for that matter). So lovely to hear from you, Michele. What an honor that you take time out on your travels to check in with the Chipmunk. And how wonderful that you have your journal with you and will be using it! It has been a very long time since I was in San Diego, but when I was, it was in the middle of the summer, and I sure do remember the muggy heat! The long walk on the beach sounds like a plan. I do hope you are having a wonderful time down there. I’m not sure if I’m sneaking in (your time versus my time) or I’m late. No worries if I’m late I still want to say that I love your stamps and love the way you organise them and cherish them. I have just read about the loss of your beautiful companion cat – such a big hole they leave in our daily lives. Hope some days are better than others for health and creating and for celebrating the moments. Go well. Greetings Fiona! So lovely to hear from you. Of course you are still in the giveaway. It’s still Wednesday here! Thanks so much for your kind comment. Indeed, some days… and moments… are better than others. But right now I’m having fun picking out things for the giveaway. Good wishes to you as well! Anyway: Happy belated blogiversary! And I wish that things will get better at least enough for you to get some more studio time. I can imagine that this is putting on extra strain on a hard time anyway by the sound of it. Hi Hilke! Sigh… yes… I too have not found a good replacement for Reader. I use Feedly, and have tried a couple of others, but it just is not the same for me. (I’ve also found that Feedly isn’t always up-to-date with its feeds, which is annoying.) I used to check Reader daily, but now I find I fall behind with my friend’s blogs a lot. I sympathize. Oh :-)! That is a nice surprise. I will look out for it in the mail. And I also installed a newsreader now. Apparently this was the final nudge I needed. I am trying FeedDemon for now. It looks good, and I get the feeling I could be happy with it. I hope that will make me miss less posts in the future. Glad to hear you found an acceptable feed reader. I checked it out, but it turns out it won’t work for a Mac user like me. Glad it will work for you, though. It seems to look a lot like Reader, from what I can tell. Thanks for the good wishes. And to you! …late, I’m late!…for a very important date!…but even so, I had to comment on how thrilled I am to have ‘accidentally’ perfectly landed on yr site!…stamps! silly…or serious…felines! SF!….All such good stuff….Glad to find you…and hope to discover more…in the morn. Hi Kendal–as you see, I’m late too–both in approving your comment and replying! But I do appreciate it! Belated thanks.